It was a legendary medicinal substance created by steeping a human cadaver in honey. In the Arab world the mummy trade represented horrific atrocities. A drug is, in the broadest of terms, a chemical substance that has known biological effects on humans or other animals. In pharmacology, a drug is "a chemical substance used in the treatment, cure, prevention, or diagnosis of disease or used to otherwise enhance physical or mental well-being." At some point in history parts of herbalism and alchemy and in fact medicine generally, transformed into the chemical soups that we know of as pharmacology today. If we turn the clock back we can explore the certain transitions, which led to all of this. Iatrochemistry (or chemical medicine) is a branch of both chemistry and medicine. The word "iatro" was the Greek word for "physician" or "medicine." Having its roots in alchemy, iatrochemistry seeks to provide chemical solutions to diseases and medical ailments. This area of science has fallen out of use in Europe since the rise of modern establishment medicine. However, iatrochemistry was popular between 1525 and 1660, especially in Flanders. Its most notable leader was Paracelsus, an important Swiss alchemist of the 16th century. Iatrochemists believed that physical health was dependent on a specific balance of bodily fluids. Iatrochemical therapies and concepts are still in wide use in South Asia, East Asia and amongst their diasporic communities worldwide. Iatrochemistry was a new practice in the 17th century, a time when traditional medicines were based on a legacy from the 4th and 5th centuries B.C. Much of this tradition was derived from Galen and Avicenna. The iatrochemists rejected the traditional medical theories of the day, mostly from Galenic traditionalists who sought to establish the balance of temperament within the body. In this balance there are two pairs of qualities, hot and cold; and wet and dry. Sickness came from the imbalance of one quality. That is, a cold was an excess of heat (hot quality), so it can be cured by reducing hot quality or by increasing cold quality. The iatrochemists, influenced by Paracelsus's belief, believed that the sickness was from the outside source, not because of the imbalance within the body. Another controversy between Galenic traditionalists and iatrochemists was the way to use herbs. The Galenic traditionalists thought that the strength of remedies relied on the amount of plant materials that were used. The iatrochemists, however, supported the chemical preparation of materials within remedies to increase the effectiveness of the materials or to find the stronger medicine. Additionally, Galenic traditionalists argued that chemically prepared medicines were poisonous, and the iatrochemists were inadequately trained. The former was true, and in some cases, both were correct. Since Paracelsus claimed that poisons could have beneficial medical effects, the number of toxic ingredients used in chemical medicines had then increased. Galenic traditionalists later adapted some of these medical methods and remedies to use in their own fields. Oswald Croll or Crollius (c. 1563 – December 1609) was an alchemist, and professor of medicine at the University of Marburg in Hesse, Germany. A strong proponent of alchemy and using chemistry in medicine, he was heavily involved in writing books and influencing thinkers of his day towards viewing chemistry and alchemy as two separate fields. Croll believed that chemistry and alchemy were two halves of a tightly related field, in the same way that organic and inorganic chemistry are related. He used the framework of Parcelsus' works to organize his beliefs about the geometrically important relationships between various forms of matter and alchemical reactions, from rectangles to megagons. Nothing demonstrates the strange acts of early drug processing more than learning how the dead were turned into medicines. Mummies of humans and other animals have been found on every continent, both as a result of natural preservation through unusual conditions, and as cultural artifacts deliberately embalmed with substances. In the Middle Ages, based on what some believe was a mistranslation from the Arabic term for bitumen, it was thought that mummies possessed healing properties. As a result, it became common practice to grind Egyptian mummies into a powder to be sold and used as medicine. When actual mummies became unavailable, the Sun-desiccated corpses of criminals, slaves, drowned and suicidal people were substituted by mendacious merchants who sold them into the markeplace. The practice developed into a wide-scale business that flourished until the late 16th century. Two centuries ago and even into the early 20th century, mummies were still believed to have medicinal properties to stop bleeding, and were sold as pharmaceuticals in powdered form as in Mummia or Mellified Man. Artists also made use of Egyptian mummies; a brownish pigment known as Mummy brown, based on Mummia (sometimes called alternatively Caput mortuum, Latin for death's head), which was originally obtained by grounding human and animal Egyptian mummies. It was most popular in the 17th century, but was discontinued in the early 19th century when its composition became generally known to artists who replaced the said pigment by a totally different blend - but keeping the original name, Mummia or Mummy. It was brown-yielding a similar tint and based on ground minerals (oxides and fired earths) and or blends of powdered gums and oleoresins (such as myrrh and frankincense) as well as ground bitumen. These blends appeared on the market as forgeries of powdered mummy pigment but were ultimately considered as acceptable replacements, once antique mummies were no longer permitted to be destroyed. 2. The Arabian – being those bodies embalmed with myrrh, aloes and other aromatic gums. 3. Dried in the Sun – but specifically in the country of the Harmmonians between Cyrene and Alexandria, being mostly the bodies of passengers buried in the quicksand. 4. Factitious – those in which bitumen and pitch were largely used in the process of embalming. A few hundred years later Thompson would review this account and write. “A rather cheerful operation for the apothecary. It would possibly account for a many mysterious disappearance in those days”. The mummy trade represented horrific atrocities to the Arab world, which had been largely colonized by European countries. The mummified remains of ancestors represented a spiritual backbone to their traditional culture and one that could not be measured by money alone. 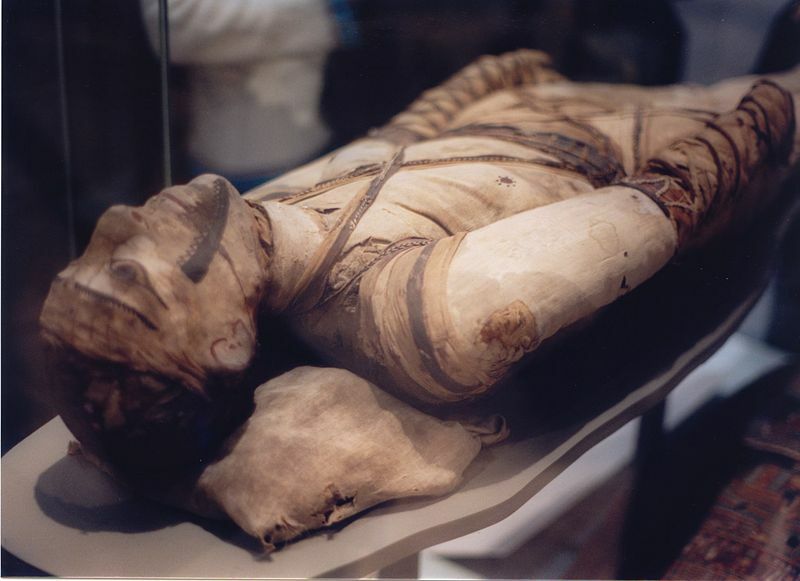 Arab physicians recognized that mummification had value in medicine but instead of raiding sacred places for sacred remains, they created a deliberate mummification process, at least according to a Chinese document. Mellified Man was a legendary medicinal substance created by steeping a human cadaver in honey. The concoction is mentioned only in Chinese sources, most significantly the Bencao Gangmu of the 16th-century Chinese pharmacologist Li Shizhen. Relying on a second-hand account, Li reports a story that some elderly men in Arabia, nearing the end of their lives, would submit themselves to a process of mummification in honey to create a healing confection. This process differed from a simple body donation because in the self-sacrifice the mellification process would ideally start before death. The donor would stop eating any food other than honey, going as far as to bathe in the substance. Shortly, his feces (and even his sweat, according to legend) would consist of honey. When this diet finally proved fatal, the donor's body would be placed in a stone coffin and filled with honey. After a century or so, the contents would have turned into a sort of confection reputedly capable of healing broken limbs and other ailments. This confection would then be carefully sold in street markets as a hard to find item with a hefty price. Li [Shizhen]: According to [Tao Jiucheng] in the [Chuogenglu "Record after retiring from plowing"], it says in Arabia there are men 70 to 80 years old who are willing to give their bodies to save others. The subject does not eat food, he only bathes and partakes of honey. After a month he only excretes honey (the urine and feces are entirely honey) and death follows. His fellow men place him in a stone coffin full of honey in which he macerates. The date is put upon the coffin giving the year and month. After a hundred years the seals are removed. A confection is formed which is used for the treatment of broken and wounded limbs. A small amount taken internally will immediately cure the complaint. It is scarce in Arabia where it is called mellified man. Mr. [Tao] has recorded it in this way but Li [Shizhen] the author of this [Bencao] does not know whether it is true so he is recording it for others to verify. In her book Stiff: The Curious Lives of Human Cadavers, writer Mary Roach observes that Li Shizhen "is careful to point out that he does not know for certain whether the mellified man story is true." Li calls the concoction miren, translated as "honey person" or "mellified man". Miziren ("honey-saturated person") is a modern synonym. The place it comes from is tianfangguo ("divine square [Kaaba] countries"), an old name for Arabia or the Middle East"). The Chinese munaiyi, along with "mummy" loanwords in many languages, derives through Arabic mūmīya (mummy) from Persian mūm "wax". Honey has been used in funerary practices in many different cultures. Burmese priests have the custom of preserving their chief abbots in coffins full of honey. Its reputation both for medicinal uses and durability is long established. For at least 2,700 years, honey has been used by humans to treat a variety of ailments through topical application, but only recently have the antiseptic and antibacterial properties of honey been chemically explained. Because of its unique composition and the complex processing of nectar by the bees which changes its chemical properties, honey is suitable for long-term storage and is easily assimilated even after long preservation. History has known examples of honey preservation for decades, centuries and even millennia. The antibacterial properties of honey are the result of the low water activity causing osmosis, hydrogen peroxide effect, and high acidity. The combination of high acidity, hygroscopic, and antibacterial effects have led to honey's reputation as a plausible way to mummify a human cadaver, despite the lack of concrete evidence. Both European and Chinese pharmacopoeias employed medicines of human origin such as urine therapy, or even other medicinal uses for breast milk. In her book, Roach says the medicinal use of mummies, and the sale of fake ones is "well documented" in chemistry books of 16th to 18th centuries in Europe, "but nowhere outside Arabia were the corpses volunteers". The underlying theories which sustained the use of human remedies, find a great deal in common between the Arabs as represented by Avicenna, and China through the [Bencao]. Body humors, vital air, the circulations, and numerous things are more clearly understood if an extended study be made of Avicenna or the Europeans who based their writings on Arabic medicine. The various uses given in many cases common throughout the civilized world, [Nicholas] Lemery also recommended woman's milk for inflamed eyes, feces were applied to sores, and the human skull, brain, blood, nails and "all the parts of man", were used in sixteenth-century Europe. Cannibalism within medicine is beginning to generate interest within historians and medical researchers. A well-known case of mortuary cannibalism is that of the Fore tribe in New Guinea, which resulted in the spread of the prion disease kuru. Although the Fore's mortuary cannibalism was well documented, the practice had ceased before the cause of the disease was recognized. However, some scholars argue that although post-mortem dismemberment was the practice during funeral rites, cannibalism was not. Marvin Harris theorizes that it happened during a famine period coincident with the arrival of Europeans and was rationalized as a religious rite. In 2003 a publication in Science received a large amount of press attention when it suggested that early humans might have practiced extensive cannibalism. According to this research, genetic markers commonly found in modern humans worldwide suggest that today many people carry a gene that evolved as protection against the brain diseases that can be spread by consuming human brain tissue. A 2006 re-analysis of the data questioned this hypothesis, as it claimed to have found a data collection bias, which led to an erroneous conclusion. This claimed bias came from incidents of cannibalism used in the analysis not being due to local cultures, but having been carried out by explorers, stranded seafarers or escaped convicts. The original authors published a subsequent paper in 2008 defending their conclusions. Modern medicine continues to delve into this subject. With genetic engineering we are seeing more abstracts regarding what geneticists might develop in the near future. However, the current marketplace is rich with examples where the human body has provided a medicine; one such example is in the field of probiotics where human intestinal lactic acid bacterial species with alleged health beneficial properties have been introduced and include Lactobacillus rhamnosus, Lactobacillus casei, and Lactobacillus johnsonii. These strains are now patent secured, valued and sold and then processed not to differently than the mummies of old. Lactobacillus casei is a species of genus Lactobacillus found in the human intestine and mouth, while Lactobacillus johnsonii is a species in the genus Lactobacillus. Its type strain is ATCC 33200. It is part of the healthy vaginal microbiota and has been identified as having probiotic properties. Its genome has been sequenced. Lactobacillus rhamnosus GG (ATCC 53103) is a strain of L. rhamnosus that was isolated in 1983 from the intestinal tract of a healthy human being; filed for patent on 17 April 1985, by Sherwood Gorbach and Barry Goldin, and the 'GG' derives from the first letters of their surnames. The patent refers to a strain of "L. acidophilus GG" with American Type Culture Collection (ATCC) Accession No. 53103; later reclassified as a strain of L. rhamnosus. The patent claims the L. rhamnosus GG (ATCC 53103) strain is acid and bile-stable, has a great avidity for human intestinal mucosal cells, and produces lactic acid. Since the discovery of the L. rhamnosus GG (ATCC 53103) strain, it has been studied extensively on its various health benefits and currently L. rhamnosus GG (ATCC 53103) strain is the world's most studied probiotic bacterium with more than 800 scientific studies. The genome sequence of Lactobacillus rhamnosus GG (ATCC 53103) has been decoded. Modern medicine continues to be a fabric held together by many threads, each of them having their own set of truths and uncertainties. As a society we wrap ourselves in that fabric and we make our choices as to how we can keep ourselves healthy and cure our afflictions. Our understanding of what is needed for good health changes with the times and history supports this fact all to well. In the 1600’s, Nicholas Culpeper believed medicine was a public asset rather than a commercial secret, and the prices physicians charged were far too expensive compared to the cheap and universal availability of nature's medicine. He felt the use of Latin and expensive fees charged by doctors, lawyers and priests worked to keep power and freedom from the general public. In early Egypt the process of mummification was the sacred backbone of faith and represented a persons transition to the spirit world. Embalmers were holy men and their services were employed by not only the royal elite but by the middle class. Mummies of deceased persons were held in the greatest of reverence by their relatives. The faces were sometimes gilded and painted and adorned with head cloths, they were then placed in elaborate cases according to the rank and position of the person and then deposited in the highest part of their houses. Charles J. Thompson in his book “Alchemy” which was first published in 1897 makes mention of an old writer who states, “They reckoned their deceased as such a valuable token and pledge of their faith, that if any of them happened to want money he could not give better security than the embalmed body of his relation; and that which made it esteemed so was, that they could spare no pains to pay the money again; for if by mischance the debtor could not redeem this pledge, he was reckoned unworthy of civil society, which engaged him indispensably to find out ways to recover his kinsman in the time limited, otherwise he was blamed by all the world”. Some 400 years ago, a large trade in mummies was being carried on mostly by Jews and later by Christians who imported them for medicinal purposes as they were much used by early physicians. As well, many thousands of mummified cats were also sent from Egypt to England to be processed for use in fertilizer. During the 19th century, following further discoveries of tombs and artifacts in Egypt, Egyptology became a huge fad in Europe, especially in Victorian England. European aristocrats would occasionally entertain themselves by purchasing mummies, having them unwrapped, and holding observation sessions. These sessions destroyed hundreds of mummies, because the exposure to the air caused them to disintegrate. All of this represented a desecration of spiritual and cultural values in the Middle Eastern world.